Senegal's Government Tries To Keep Its Youth From Making The Risky Crossing To Europe : Goats and Soda Many African men hope for a brighter future across the Mediterranean — and risk their lives to make the crossing. Senegal is trying to make sure they don't go. 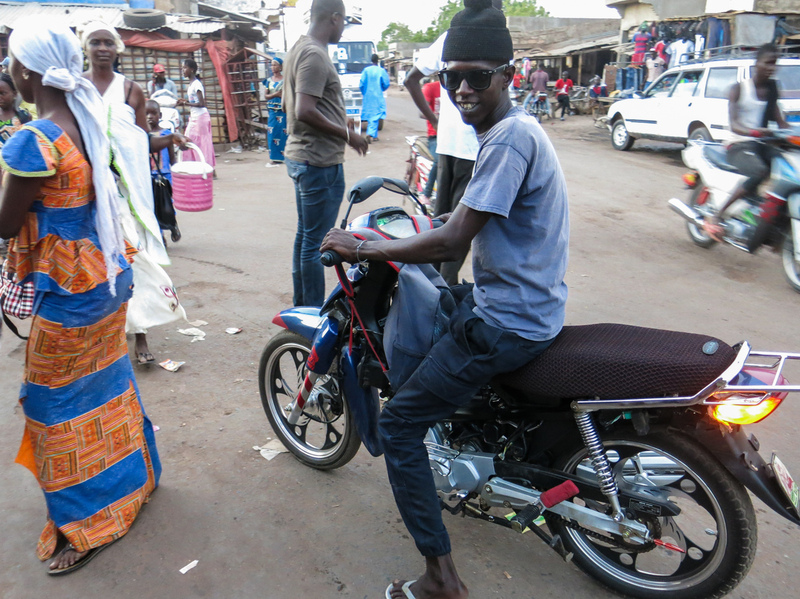 Assane Thiobane, 28, a motorbike taxi driver in Tambacounda, eastern Senegal, is saving up to leave for Europe, where he hopes to earn more money for himself and his family. If you die along the way, he says, that's your destiny. It's a familiar story. A young man leaves his family in search of a golden land, a place where he can earn more money to send back home. In the past, the story has led to happy endings as well as tragedies. That is also the case in the 21st century. Last week, there were reports of 700 migrants who likely perished in three shipwrecks in the Mediterranean while crossing from Libya to Italy. One African country that is hemorrhaging young men is Senegal. They're leaving the West African nation in the hope of a better life in Europe. The Senegalese authorities want to stop them from risking their lives on rickety boats in the Mediterranean Sea or while crossing the Sahara desert, as they seek their fortunes abroad. These youths face pressure to go — and pressure to stay home. Souleymane Sebor, now a welder in Balla, eastern Senegal, was deported as an undocumented migrant from Libya. He was trying to get to Italy. Now back in Senegal, he says he won't try again without documents. Souleymane Sebor dons sunglasses as protection from flying sparks and squats to work on a long metal pipe. He's a welder and father of five children with his two wives. Sebor is one of many Senegalese men who tried to make it to Europe as an undocumented migrant. He says he didn't even get to Italy. He was turned back from Libya and says he won't be trying to venture to Europe again without papers. "I left Balla in 2013, because the job I was doing was not going very well," Sebor says. "I have my wives and I had to feed the family. So I had to go, that's the main reason I left. 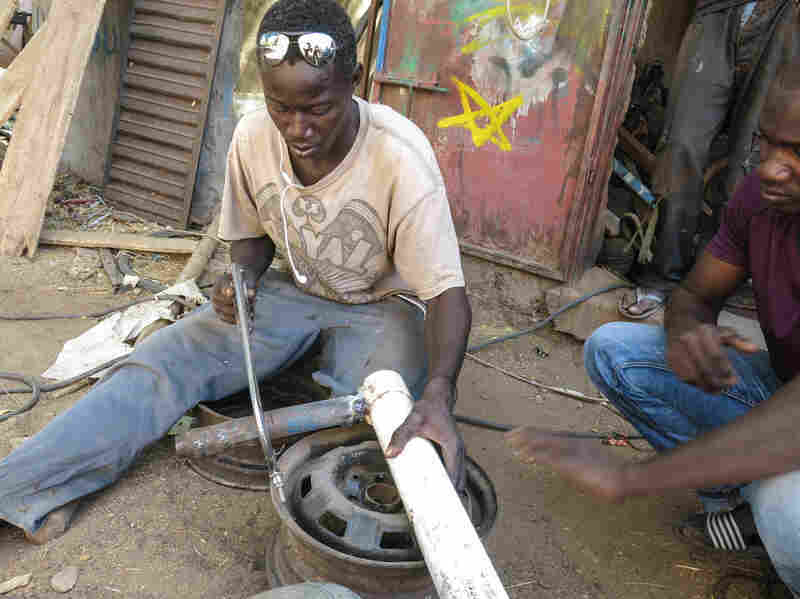 The work I'm doing does not provide much money and this type of welding work in Senegal does not pay much. Manual workers don't earn that much and that's one of the reasons why I left. I heard that in Italy it's a profession that pays well." The 32-year-old lives in the village of Balla in eastern Senegal, which is at the heart of the migrant exodus. Sitting at the ramshackle rural home he shares with his young family and sick mother, he tells me that financial pressures are pushing Senegalese men — young men in particular — to leave home. Kadiatou Cisse and her youngest son, Souleymane Sebor, who tried and failed to get to Italy. Sebor's sick mother, 56-year-old Kadiatou Cisse, is familiar with the situation. Sebor is her youngest child. While she was still pregnant with him, she says, her husband traveled from Senegal as an undocumented migrant, leaving her to raise their four children. Her eyes mist over. She fears history may be repeating itself. "It's as if my children are infected with the same migration bug," she tells me. "It's a gangrenous cancer." The government says the youth must stay home and farm in Senegal. Foreign Minister Mankeur Ndiaye — who's also responsible for emigration and Senegalese overseas — repeated this mantra to NPR. "We are developing projects in agriculture ... to allow our young people to stay in the country and to have a job," he says. "But, sir," I say to him. "It's not working. Young men are still leaving in droves." The minister's reply: "But I am sure that it will work." "It will work, soon, soon, soon," he says. Not soon enough for many men who are still determined to go to Europe. Local nonprofit organizations like La Lumiere — The Light — and others are trying to find practical solutions and projects to help deported returnees resettle and remain in Senegal. Brahima Sory Diallo heads the Senegalese nonprofit. He says they've set up a number of fruit and vegetable gardens and other projects in the region, with mixed results. "Tambacounda is a poor region and we haven't any possibility to give jobs for young people," he says. "In this region we have only one industry — cotton. 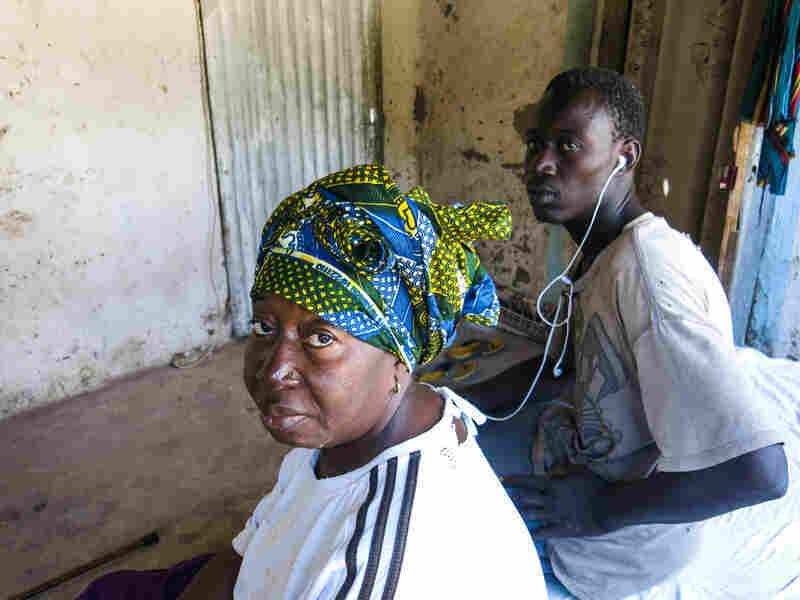 Since 10 years, this is not going well; that's why young people in Senegal can't have jobs." "Right now in Senegal, if you go to Kolda area, I can show you more than 100 young men who stay here and [are] working with us," he says. But Diallo acknowledges failures, too, and says some young men join a startup like La Lumiere's projects, then, with whatever money they earn, make another attempt to reach Europe. "In Missirah, we have started a community project, one big garden for 50 young men," he says. "Four go back, return in Libya. One of them is dead, but young men are waiting for the project Missirah [to start in earnest]. Ghimba Diakhite, from Dyabougou village, near Missirah, is another returnee — deported from Europe. Standing in the scorching sun, he proudly shows us a plot of land that has been fenced off, ready for planting by him and other young men, who were also deported from Europe. The returnee, Diakhite, says he has chosen to remain in Senegal now and is trying to make a go of life at home. Diallo, head of the nonprofit, says they're aware that making a special case of helping those who've been deported may seem unfair to other young men in the area who are also job seekers. He stresses that projects need to be inclusive. At the main bus station in Tambacounda, where many would-be migrants start their odyssey, I meet Assane Thiobane, a 28-year-old motorbike taxi driver. Watching so many young men leaving for Europe, is he inclined to go or to stay in Senegal? Wearing trendy sunglasses, Thiobane gives an unequivocal answer: "Yes, I am a candidate for immigration. Life is difficult in Senegal and it's hard to earn enough money here to help yourself and look after your family." Thiobane is not married and has no children but helps his family financially and wants to do more. He is looking to leave Senegal as soon as he has saved up enough money. And that's despite the fact that the Senegalese, like many others worldwide, continue to watch disturbing images of desperate migrants being rescued on the high seas, or worse, perishing in the Mediterranean. Thiobane's reply when he's asked if he's afraid he may die trying to get to Europe is: "We are Muslim. If you are to die in the waters of the Mediterranean or in the Sahara, that's your destiny."